A blog post about Nightlife, Dating and Girls in Florianopolis, Brazil! OVERVIEW: This may just be the best city in Brazil for everything aside from cost of living and hooking-up. Florianopolis is a mid-sized city located in the south of Brazil. It is known for having the best standard of living in the country and for being one of the most popular cities in the world for foreign real estate buyers. WEATHER: Humid subtropical (15-30 °C). Rainy season January-March, but rainfall is typical all year. SAFETY: One of the safest cities in Brazil. Take normal precautions, but is unlikely that you'll ever feel at risk here without asking for it. MUST DO: Explore the entire city. Half of the city is on the mainland of Brazil, and the other half is on an island. Don't limit yourself to one side. Knowing some Portuguese here is a must. And even if you're fluent, it's still not going to be easy. There are a couple things working against you in Florianopolis when it comes to gaming the local gals. First of all, the girls here are of a higher socioeconomic status which generally means that they will be harder to bed, and be less impressed by a foreigner. Second of all, because Florianopolis is a smaller city, most of the girls here live with their parents, so logistics is a hurdle that you must circumvent. The girls here are friendly and quite open to conversation (if you find a common language) but it isn't the first city I'd visit in Brazil to get laid. ARE GIRLS HOT IN FLORIANOPOLIS? : 9.25/10. Amazing girls here. I don't know anyone who'd tell you different. There are many European-looking women here in Florianopolis who are tall and blonde with light eyes, but there are also plenty of gorgeous mulatta girls, more of whom you'll see around centro as opposed to the beach. I'd rank Florianopolis slightly above Rio de Janeiro. RENT AN APARTMENT IN FLORIANOPOLIS: $500.00 rental prices are likely to get much higher after the World Cup and before the Olympics. In 2009, Florianopolis was voted by the New York Times as the world's "Party destination of the year." While this is an obvious exaggeration, or only true for the upper wrung of society, there are still plenty of places where the average guy can have some fun. There's a very distinct high season here (after Christmas til Carnival celebrations in February) and you're nightlife experience will vary depending on what time of year you're able to visit. I recommend: Cosmopolita Club. Full of Patricinhas (rich girls) but still possible to mingle. 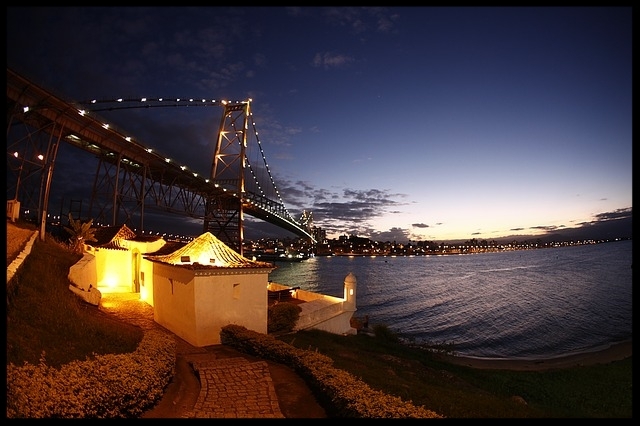 It's in centro, which is the best place to hang to go out if you want to meet locals, but most of the nightlife is in the Lagoa da Conceição district. JOB OPPORTUNITIES: Try to get in to the real estate market here. TAXI: Should be around $3.50 $5.50. NOTES: A very beautiful city. Just like Natal, I'd recommend Florianopolis for an extended stay because of it's natural beauty, safety and overall pleasantness. However, if you don't know any Portuguese, you'd be better off going to a different city in Brazil, like Sao Paulo or Rio, before coming here. Speaking Portuguese here is more vital to gaming than it is in other Brazilian cities and also for breaking into social circles. Coming to study Portuguese here is a good option, but I'd still recommend Belo Horizonte first because there is a slightly more identifiable gringo community to fall back on in times of need.